25-35 Winchester ammunition, also known as the 25 WCF, is a Winchester repeating arms round designed in 1895. The 25 - 35 Winchester utilized the 30 - 30 case as its parent case, necked down to accept the 25 caliber projectile. Like the 30 – 30, the round was designed to be used in lever action rifles, specifically the famed Winchester 1894 lever action repeater. The 25 - 35 Winchester can fire a 117 grain bullet 2300 feet per second. Lighter projectiles, as light as 60 grain can reach a velocity of over 3,000 feet per second. The 25 - 35 WInchester was designed to hunt small to medium sized deer species at close range. 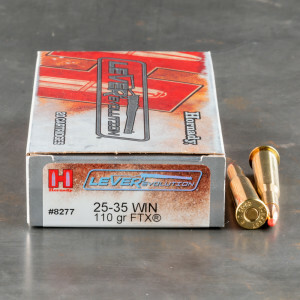 The 25 - 35 Winchester is an excellent brush cartridge, especially for new or smaller framed shooters. The 25 -35 Winchester is also easier to handle is a lightweight, carbine, lever action due to it’s minimal recoil. The round can also be used for predators and varmint, and tends to leave a small exit and entry wound to preserve the hide for taxidermy.